TYCO's 1987 catalog is the first full product line listing to be printed with a permanent-bound spine-style. 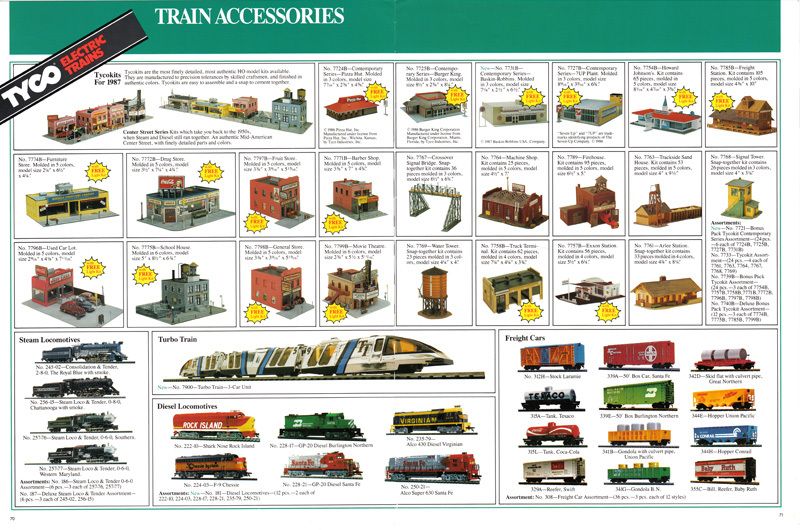 The 1987 catalog is full-color and 8 1/2-inches by 11-inches in size and totals 91-pages. Product lines are divided into various sections and include: R/C Radio Control (pages 4-17), Pre-School Super Blocks (pages 18-25), Super Blocks (pages 26-35), Tuffies (pages 36-39), Tendertoys (pages 40 and 41), Super Dough (pages 42-45), Rocket Rollers (pages 46 and 47), Electric Racing (pages 48-61), Electric Trains (pages 62-73), Ghostbusters (pages 74-77), Speed Wheels (pages 78 and 79), Stomper (pages 80-87), and Speedsters (pages 88-91). TYCO's US-1 Electric Trucking product line is missing beginning with this 1987 catalog. 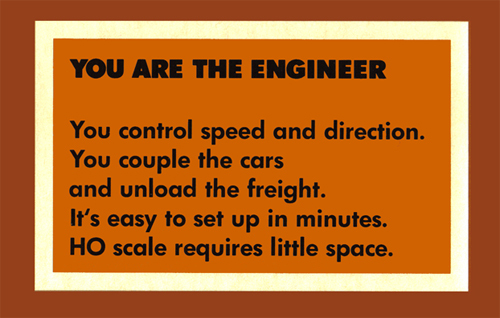 US-1 Trucking had appeared in TYCO's 1981-1986 catalogs. 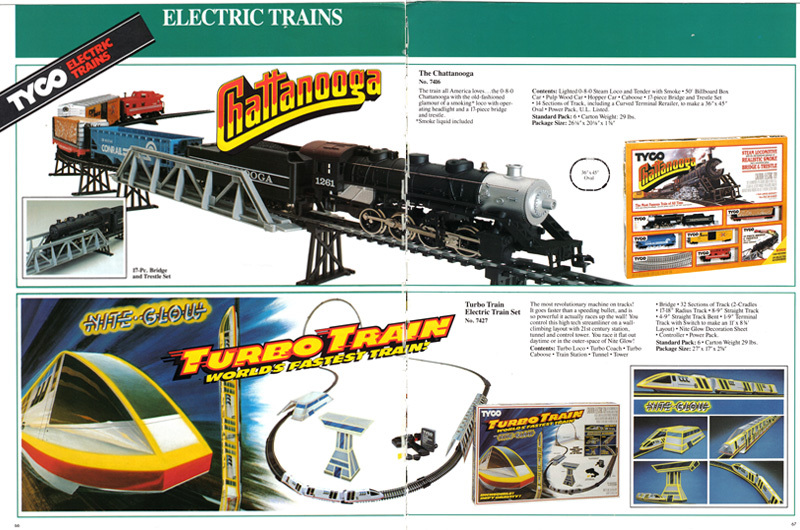 TYCO's HO-scale Electric Trains begins a slow retreat starting with the 1987 catalog. The train selection continues to shrink beginning with this 1987 group through the final year TYCO lists HO-scale trains in 1993. 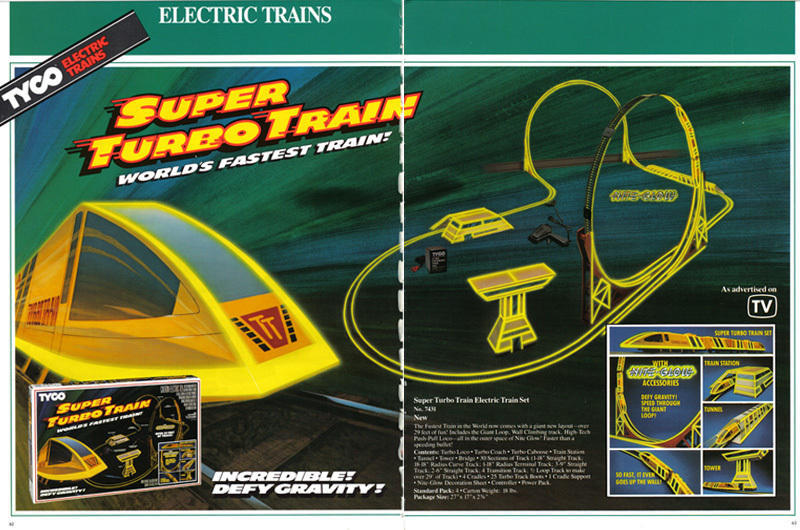 For 1987, TYCO has a pair of its Turbo Trains in train set form. The Super Turbo Train (#7431) and Turbo Train (#7427). 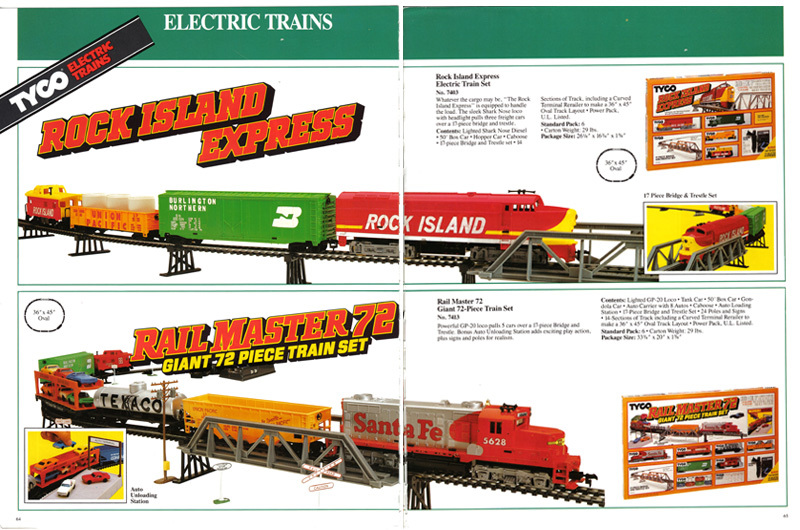 Regular HO-scale train sets included only five offerings: Rock Island Express (#7403) with a Rock Island Shark Nose Diesel, Rail Master 72 (#7413) with a Santa Fe GP20, The Chattanooga (#7416) with the silver ended-bolier 0-8-0 Steam number 1261, Rocky Mountain Express (#7417) with a BN GP20, and Railroad Empire (#7429) with a Santa Fe Super 630. TYCOKITS remain healthy for 1987 with 23 examples including the popular Pizza Hut and Burger King kits. Most kits carry a "B" at the conclusion of the stock number, which designated that they included a FREE Light Kit. 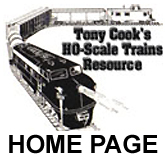 TYCO's Steam Locomotives in HO-scale roster only four: The Royal Blue Consolidation 2-8-0 and Tender with Smoke (#245-02), Chattanooga 0-8-0 and Tender with Smoke (#256-15), Southern 0-6-0 and Tender (#257-76), and Western Maryland 0-6-0 and Tender (#257-77). Above the section for Diesel Locomotives sits TYCO's 3-Car Turbo Train (#7900) in shiny chrome with blue-and-black stripes, "TT" logo, and carrying numbers 2, 5, and 9 on the units. HO-scale Diesel Locomotives are represented by a selection of six: Rock Island Shark Nose (#222-10), Burlington Northern GP20 (#228-17), Virginian Alco 430 (#235-79), Chessie System F9 (#224-03), red-and-silver Santa Fe GP20 (#228-21), and a Santa Fe Alco Super 630 (#250-21). Freight Car displayed in the 1987 TYCO catalog included: Laramie stock car (#312H), Santa Fe 50-foot box car (#339A), Great Northern skid flat car with culvert pipes (#342D), Texaco tank car (#315A), Burlington Northern 50-foot box car (#339E), Union Pacific hopper car (#344E), Coca-Cola tank car (#315L), Union Pacific gondola with culvert pipes (#341B), Conrail hopper car (#344H), Swift reefer (#329A), Burlington Northern gondola with barrels (#341G), and Baby Ruth billboard reefer (#355C). 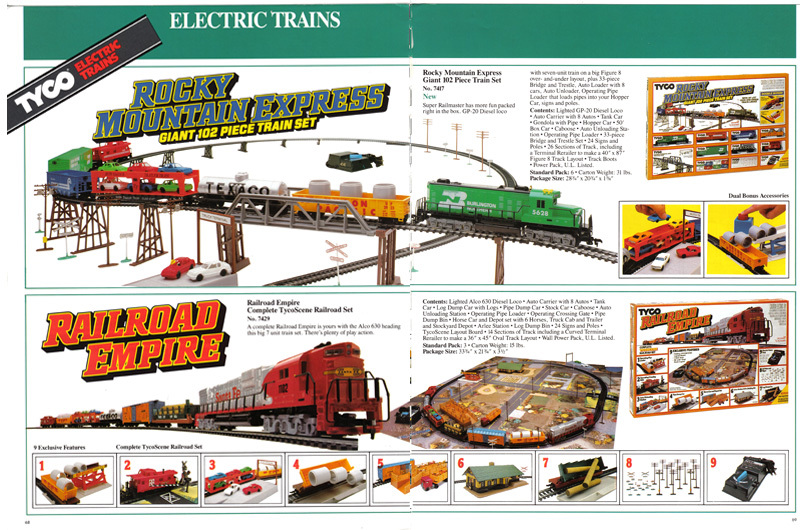 Train Accesories are spread across pages 72 and 73 in the 1987 listing and include the TYCOSCENE Layout Board (#7940), Operating Floodlight Car (#346) decorated for Burlington Northern, Crane Car with Boom Tender Set (#865) in light-blue The Rock dress, Electronic Sound of Steam in 50-foot Box Car (#957) with a blue and yellow Baltimore & Ohio "Timesaver Service" scheme Box Car, Crossing Gate (#908), Horse Car and Depot Set (#869), Piggyback Loader/Unloader (#903) with Santa Fe 50-foot Flat Car and 2 Union Pacific trailers, 33 piece Bridge & Trestle Set (#909), Tyco Pack (#895), Giant Operating Crane (#950) with blue Conrail bulkhead 50-foot Flat Car and USS Steel red-and-blue Crane, Tack Layout Expander (#7903B) with included a FREE 48 piece Accessory Set (17pc. 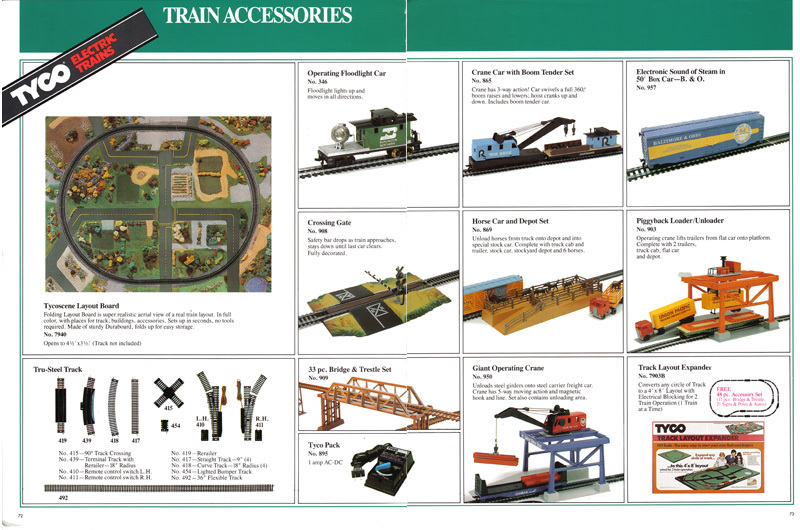 Bridge & Trestle Set, 21 Signs & Poles & Autos), and a variety of TYCO's Tru-Steel Track.